With the First Advent today Christmastime has officially started. Christmas markets in Germany traditionally open their doors on this weekend and it’s the cozy time of chestnuts and Glühwein. Also here in California homes are being decorated with Christmas lighting and harbor cities are gearing up for the boat light parades. Christmas tree lighting events in malls have already taken place last week before Thanksgiving and winter festivals like the Sawdust Winter Fantasy Festival in Laguna Beach do their best to get you in the holiday spirit. Take a stroll with us through Sawdust Winter Fantasy Festival with our slideshow below. Noguchi – California Legacy is closing tomorrow, Oct. 2nd. If you get a chance head down to Laguna Beach tomorrow and make it a Sunday outing. It’s a small but really beautiful exhibit. The photographs don’t do justice to experiencing the sculptures ‘real life’. 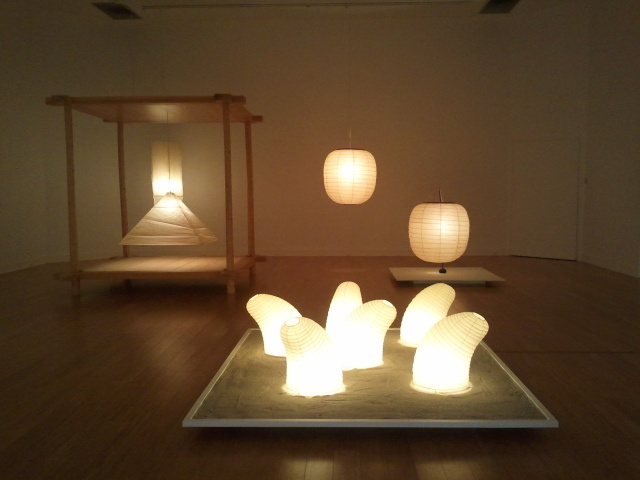 Standing in the room with the Akari light sculptures and taking in each one of them, makes you feel like standing in a sanctuary of peace and tranquility. Should you miss to see the Noguchi exhibit at the museum look for the sculpture garden ‘California Scenario’ at the South Coast Plaza Town Center. So pay Laguna Beach and its museum a visit and make it a day of art at the beach tomorrow. Happy weekend!